Hundreds set out to have a good time at Government House Ballroom on the night of 23 August 1925. Young men and women dressed to the nines to party in aid of St John of God Hospital. At half past one in the morning, few dancers observed a tall, slim girl with short dark hair, dressed in a blue silk evening frock. She crossed to an attractive young couple in the centre of the floor and spoke with the tall well-built young man, handsome and smartly dressed in evening suit. He turned and said something to her as the orchestra started up. Suddenly above the wail of the saxophone and the drums came a loud noise. The music and dancing ceased and all eyes turned on the man as he staggered and fell to the floor with a heavy thump. Cyril Gidley was arrogant, cruel and violent. Dodgy Perth will spend no time mourning his loss. Instead we turn our attention to the attractive 20-year-old art student whose life was never to be the same again. Audrey Jacob. Audrey had been engaged to a naval officer, Claude Arundel, when Gidley had come on the scene around twelve months before his death. After much persuasion, she broke off her engagement and agreed to marry the new man in her life. But one night, on the way to Gidley’s lodgings, they quarrelled because she had received a letter from her former fiancé. Gidley became enraged. He picked her up and carried her to his room. When she was exhausted he grabbed the art student by the throat and hissed the single word “Yes” at her. The next day Audrey’s mother found her crying, and noticing the bruises on her neck, guessed what had happened. On the fateful night in August 1925, a girlfriend persuaded Audrey to attend the ball at Government House. They went dressed as Pierrot and Pierrette. It was then that she noticed Gidley dancing with another girl. She approached him, questioned what he was doing, but he told her to mind her own business and leave him alone. Audrey ran from the ballroom and returned to her lodgings on the corner of St George’s Terrace and Howard Street. Sobbing for half an hour, she started to undress, before noticing a loaded revolver in her drawer. Deciding to end it all, she put on her blue evening dress, and walked to the foreshore. But here she began to consider what would happen to her immortal soul if she used the gun on herself. Instead, she went to the Roman Catholic Cathedral, and there, at midnight, knelt in the grass and recited the Rosary. A strange calm came over her, and she decided to return home. But passing the ballroom, she noticed that the party was still going on. She made the decision to make a final effort to speak to the man she loved. The room span and something snapped. In this dazed condition, Audrey raised her hand to her head—and then she heard a shot and saw Gidley fall. After deliberating for an hour and a quarter the jury returned a verdict of not guilty. Audrey rose from her seat, and her mother rushed into the dock. No attempt was made to stop an outburst of applause from the crowded gallery. It was always going to be impossible to resume life in Perth, and Audrey married an American industrialist, Roger Sinclair, and left for New York early in 1926. For Perth, though, this was not the end of their fascination and for several years rumours continued to fly that Audrey was stranded penniless in South Africa, or that her husband had turned out to be a bigamist. 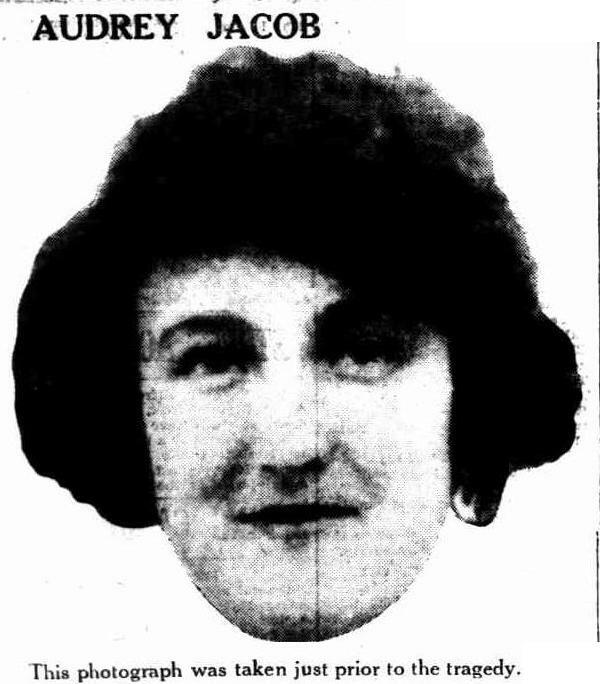 None of these stories were true, of course, and the last we know of Audrey Campbell Jacob is that she arrived in Boston on 2 May 1926 on board the Celtic. After that, Perth never heard from her again.